How could Bill McEwen, creator and CEO of SpaceList, create a commercial real estate marketing platform that not only outpaces LoopNet but has become the go to site for Canadian brokerages? It’s due in part to his commitment to never charge anyone to list or search. But it’s also because SpaceList understands what it is – a marketing platform. As such, they’re always looking for new and better ways to assist brokerages in promoting their listings. It started with a cleanly designed search interface, mapped properties, lots of detail, responsive web design – and they’ve always offered website listing integration via an iFrame and an API so subscribers can create customized search/listing pages. Data entry is pretty much automated thanks to the fact that most commercial brokerages in Canada have their listings in a database (take note U.S. brokerages…). Manual data entry? They do that, too. This kind of focus has paid off. 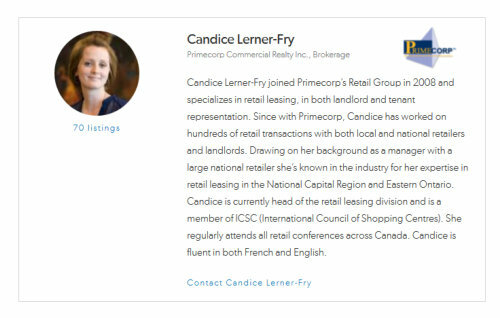 It’s how they’ve been able to collect and display over 80% of Canada’s commercial space for lease (with sale listings on the way) – and build a name for themselves. 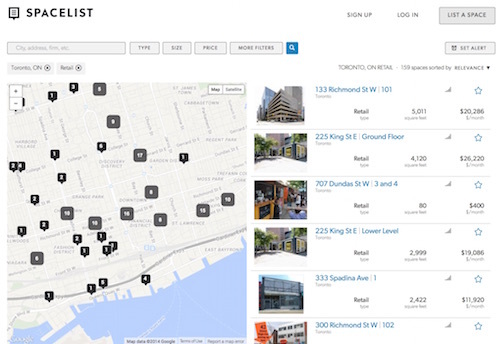 Just try a search for commercial office space in Canada’s major cities. SpaceList is likely on the first page of results and often above LoopNet. No aggressive or expensive AdWords campaign. It’s from patiently building a site that successfully answers the needs of brokerages, developers and users. So what’s SpaceList been up to since I last wrote about them? MacEwen has been testing and tweaking a series of reasonably priced, a la carte premium features that add measurable value to the marketing process. Not content to be a LoopNet clone, they’re uniquely designed to take the best of the old and adding something new. For about $20 per month, you can fully brand your listings with a photo and logo, plus get an agent page in the directory listing that also works as a stand-alone online resume. MacEwen feels adding the profile directly to the listing brings credibility to the agent and builds user trust. I’ll admit I didn’t think this was a big deal but when I saw it, I realized it actually “humanizes” the listing. Nice touch. Featured property packages have usually involved a flat fee for top of the list placement or, in LoopNet’s case, the “opportunity” for agents to underwrite the cost of free search. SpaceList offers something a little different. For a price per SF, they’ll take photos of your property and manage optimal placement on the site. Two contracted pricing levels – an up-front fee or higher fee paid once the property is sold or leased– lets agents decide how much financial risk they want to take. After seeing the effectiveness of these listings, however, most agents who started out with the higher fee option switched to paying up front. Knowing that your listing was viewed by 100 people doesn’t mean much by itself. Isn’t it about time that someone gleaned a little more out of anonymous visitor data? How about showing owners what other buildings visitors view along with theirs. Then, via algorithms, come up with clusters of “like” buildings so owners can see how they compare to the competition. SpaceList offers analytics like these priced per building. To sign up for SpaceList Pro, start your free trial here (http://spacelist.ca/products/pro_profile). Or if you just want to check out the site, visit SpaceList.ca. Nice overview, Chris – they are deserving of the attention. We’re big fans of the SpaceList online marketplace interface. 80% of available space covered – that’s no small feat. Of course we’d love to build a site for a Canadian firm that integrates their mobile-friendly, customizable API!